Skype is obviously just an example, and the same thing can happen on sites like Facebook, Twitter, Google, other messaging apps, your mobile phone or email app as well. Even a computer system with up to date protection can become infected if a new type of virus is being spread that the antivirus software does not identify as a threat yet. An HTML link that displays a different link in the text than it actually links to. You can use web services such as LongUrl or CheckShortUrl to reveal link targets without clicking on the links to do that by yourself. All you need to do is copy the link, by right-clicking it and selecting copy, or highlighting it and using Ctrl-c to copy, to paste it in the form on one of the two sites linked above. You will automatically be taken to a page that reveals the long url here so that you know where the short link takes you before you click on the link. Instead of using a web service to expand short urls, you can instead install and use a browser extension. 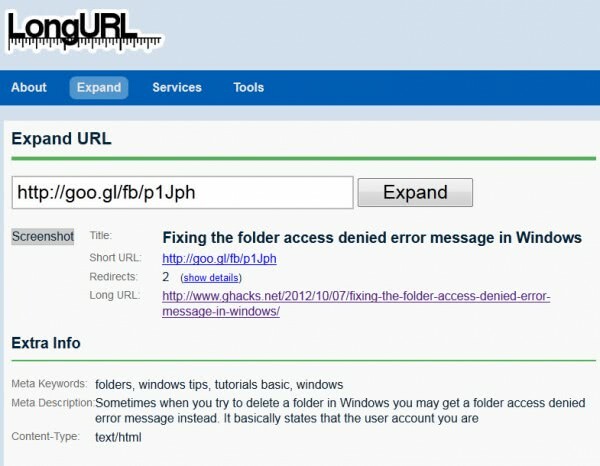 These extensions are limited in reach, meaning that you usually can’t use them to expand short urls that you encounter in other programs running on your system. Firefox users can take a look at Long URL Please while Chrome users should try out Explode instead. The href defines the link target, the link text is enclosed in between the command. All you need to remember is that the link text is a string that can look like a domain name or url. Instead of looking at the source code, you often can simply hover your mouse cursor over the link to find out more about the link destination. 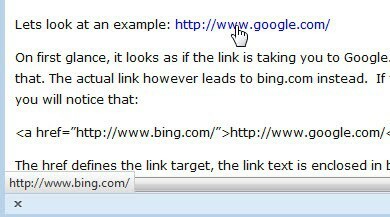 As you can see in this case, hovering over the google.com link reveals that it actually leads to bing.com. It is important to verify links before you click on them. This is especially true for high profile links that point to financial websites or other websites that you have a connection with. This entry was posted on Thursday, October 11th, 2012 at 9:39 am	and is filed under security, tech support. You can follow any responses to this entry through the RSS 2.0 feed. Both comments and pings are currently closed.